floor in Corpse Pose. The backs of the legs should be resting firmly on the floor, your two legs spread slightly apart—hip-width or perhaps a little wider. The backs of your arms should be resting securely on the ground, with your arms spread slightly apart from your body, your palms facing up. You are now ready to do a nice, long relaxation. This relaxation will allow you to integrate all the benefits of the yoga session that you have just been doing, as well as to release any toxins and tension from your body. First, you'll begin with a physical relaxation, followed by a mental relaxation, for a complete relaxation of body, mind, and soul. Extend your right leg out in front of you. Pick it up off the ground. Squeeze it tightly. Now release it. Extend your left leg out in front of you. Pick it up off the ground. Squeeze it tightly. Now release it. Gently roll your legs from side to side and let them slowly come to a comfortable position as they spread out slightly away from the midline of the body. Now pick your buttocks up off the ground. Squeeze them. Release them. Lift your shoulders up high toward your head. Now lower them down completely toward your feet. Now relax your shoulders. Extend your right arm long alongside your body. Pick it up off the floor. Squeeze it tightly. Make a fist out of your right hand. Hold—tighter, tighter, tighter. Now let go of your arm. Release it to the floor and allow it to relax. Extend your left arm long alongside your body. Pick it up off the floor. Squeeze it tightly. Make a fist out of your left hand. Hold—tighter, tighter, tighter. Now let go of your arm. Release it to the floor and allow it to relax. Gently roll your arms from side to side and let them slowly come to a comfortable position as they spread out slightly away from the midline of the body. Let your fingers be open and relaxed. Squeeze your face. Make it into a prune. Stick out your tongue. Crinkle your nose up into a tight ball. Now release your entire face and relax it. Take some time now to travel back up through your body from the toes of your feet to the top of your head as you release any residual tension that you may still be harboring. Bring your awareness to your feet. Say to yourself, "My feet, ankles, and heels feel warm and heavy and are relaxing. My feet, ankles, and heels are completely relaxed. My calves, knees, and thighs feel warm and heavy and are relaxing. My calves, knees, and thighs are completely relaxed." Now bring your consciousness to the hips, the buttocks, the pelvis, and the organs of the pelvis. Say, "My hips, buttocks, and pelvis feel warm and heavy and are relaxing. My hips, buttocks, and pelvis are completely relaxed." Bring your awareness to your back, spine, and torso. Say, "My spine and back feel heavy and warm and are relaxing. My spine and back are completely relaxed. My abdomen, torso, and chest feel heavy and warm and are relaxing. My abdomen, torso, and chest are completely relaxed." Bring your awareness to your shoulders, arms, hands, and fingers. Say, "My shoulders, arms, hands, and fingers feel heavy and warm and are relaxing. My shoulders, arms, hands, and fingers are completely relaxed." Now bring your awareness to your neck and head. Say, "My neck, jaw, chin, mouth, cheeks, eyes, forehead, back of my head, and scalp feel warm and heavy. My neck, jaw, chin, mouth, cheeks, eyes, forehead, back of my head, and scalp are completely relaxed." Now bring your awareness to the internal organs of the body. Say, "My intestines, stomach, pancreas, liver, lungs, kidneys, and even my brain feel warm and heavy and are relaxing. My intestines, stomach, pancreas, liver, lungs, kidneys, and even my brain are completely relaxed. My entire being—body, mind, and soul—is completely relaxed." Yoga nidra is a time for deep surrender. Allow yourself to surrender completely as you absorb and integrate all the benefits of the postures you have been performing. Allow your breathing to be full, deep, and relaxed. Enjoy the blissful sensation of peace and calm as you allow yourself to surrender your body, mind, and soul. You have nothing to do—only to be. Just be, in this present moment. Be receptive to the healing power of the life force that is flowing through you with each breath that you take. Be grateful for the restorative and energizing power of this relaxation exercise and of all of your yoga practice. Yoga nidra affords us the opportunity to be not only physically relaxed, but also more mentally aware. Take a moment to register your awareness of how you feel. 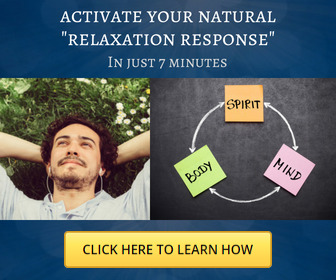 Do you feel differently now than when you first lay down to begin the relaxation exercise? If you have just finished practicing the yoga postures, do you feel differently than you did before you began your yoga today? Does your body feel lighter? Heavier? Denser? Are you aware of any areas of opening? Or any areas where you might still be holding? How does your breath feel to you? Is it deep, calm, and relaxed? Or short and irregular? Do any visual images or auditory or tactile impressions arise? Are you falling asleep? Register your awareness of any sensations that you may be experiencing. Note them, and let them go. Allow yourself to remain in this restorative and meditative final relaxation posture for as long as you wish. When you are ready to return to the here and now, do so slowly and mindfully. Begin to bring your awareness back to your breathing. Take a deep, full inhalation and a deep exhalation. Wiggle your fingers and toes gently. Stretch your arms up over your head and out on the floor above your head. Stretch out your legs and arms, giving you a nice stretch from head to toe. Gently open your eyes. Feel as though you are waking up and stretching as you would in the morning after a good night's rest. Imagine what an infant feels like as it stretches out after a peaceful nap. Hug your knees up to your chest. Roll your knees from side to side. Then gently roll over onto one side in a fetal position. Supporting yourself with your hand and arm, slowly come back up to a sitting position. Take the time to thank yourself for allowing yourself to do this stress-reducing and energizing yoga practice today. Thank yourself for giving yourself the gift of this relaxation. You're on the road to yoga health and well-being. Keep up your journey!